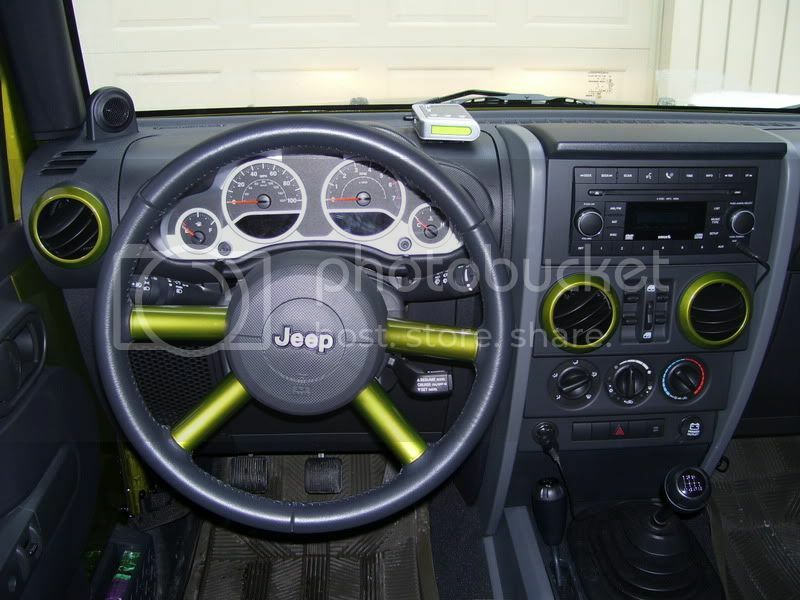 JeepForum.com > Models > Jeep Wrangler Forums > JK Wrangler Technical Forum > What did you do to your JK today? Tires: OEM Bridgestone Duellers, 32"
Stole this idea from the TJ forum who stole it from the YJ forum. When I had my TJ this was one of the best threads to get ideas from and was full of great pics. Today I powerwashed the heck out of it after my trip on Sunday to the Badlands. See HERE for trail report. Engine: The latest creation, time will tell..
Another thing I did today is remove the AC vent rings for painting. Bought two cans of Rescue Green from the dealer and a can of duplicolor clear coat from O'Reilly. Need to pick up primer tomorrow. I'll be sure to post up pics when done. Accessories: Rugged ridge light bar, bunch of other stuffs. Came home from the dealer because they can't fix the leaky top (lol). They have to order parts. Going back Monday. Yesterday I drove her on the beach, and tore up (not in a bad way) the beach and had lots of fun. drove it for the first time (and my first stick experience) in morning rush hour traffic! Showed it off to a few coworkers, then wiped down the dash/radio/instrument cluster to get rid of all the dust that came in from having the top down on 2 miles of overgrown two-track road by the lake the other night. I had my Jeep in the shop all day getting the squeaky clutch fixed. Runs great now. Worked on my Mopar front bumper mods to fit the Warn PowerPlant. All this sounds awesome. Pictures anyone? Yeah guys, let's keep this thread going with detail and pics. Here's a pic I stole of what it "should" look like when I'm done, minus the steering wheel spokes which is only for '08 and above. I pulled mine into the shop I work at, and tried to see why my e-brake isn't working. Pulled the covers off the center console and saw a "U" shaped metal spring/bracket (?) in there that looks out of place, but I can't figure out where it goes. Anybody know anything about the e-brake mechanism? Accessories: Too much to list.